It may be a side effect of fixing the peek4() CPU cycle exploit, but now all “adjusted” functions seem to cost the same as if they were standard Lua API calls. The following program used to run at 21.6% CPU on 0.1.11f. Now on 0.1.12b it runs at 64.5% CPU! It’s now possible to include .lua files, but PICO-8 seems to be very confused when they have CRLF line terminators, reporting syntax errors at weird locations. It’s not unusual to have CRLF line endings, even unwillingly; for instance, if I push a .lua file to Git from a Linux box (with LF line endings) then pull the file on Windows, by default it magically gets CRLF line endings. This can be configured but it may confuse users. The function peek4() does not properly check its number of arguments, so calling it with no arguments will cost zero cycles. Combined with any other function that costs fewer cycles than its number of arguments, such as shl(), this can be exploited to reclaim CPU cycles. I do not know to what extent this can be exploited, but here is an example. I have started measuring function costs precisely, because I like accurate things. It’s all on the wiki but not fully complete. Some of these, such as clipped <code>circ()</code>, are pretty tricky to measure, I hope someone can help! Edit: removed claim about shl() because that function behaves a bit differently. Just a work in progress. The parser is not perfect but it needs a lot of work. This is my entry for #TweetTweetJam: an unfinished shooter, in about 530 characters of code. Left/right to move, X to shoot. It has music and SFX and many things but no actual gameplay. My love Niarkou and I made this for Ludum Dare in 72 hours! Objectives: Feed your cats by filling their bowls. The more they eat, the more points you get! But too many cats and you will run out of space. I was working on this a while ago and haven’t found much time for it lately, but I thought it could be interesting to some people. It is a fork of Lua that implements the PICO-8 dialect. If you know how to embed Lua somewhere, then there are chances that you can embed PICO-8 compatible Lua instead! I use it for an unfinished toy emulator project. compound assignment operators: += /= etc. fixed-point arithmetic with overflows, infinity etc. The usual approach to the language extensions is through code parsing and patching. For instance, replacing all occurrences of <something>+=<blah> with <something>=<something>+(<blah>). This is what PICO-8 itself does, which is why it still has the occasional weird parsing issues (you can write x=0y=1 but not x+=0y=1). My approach is to implement these extensions in the Lua parser instead, which is elegant, more robust, and gives better error reporting. We made this game over the weekend as some practice for Ludum Dare. It is named after one of our cats. Controls: left/right to move, X to fire. I was working on this during Ludum Dare 39 (4 months ago) but never got the courage to finish it… maybe one day! Made for Ludum Dare. It’s 2 minutes before the deadline, I need some sleep now. 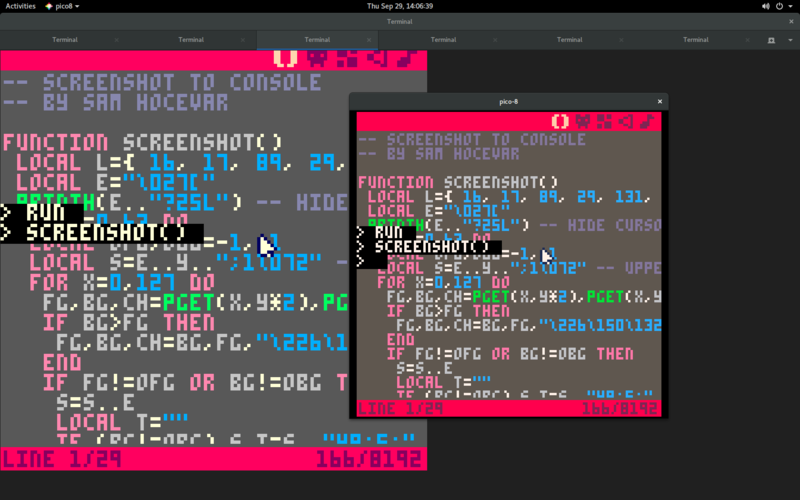 This function abuses Unicode and ANSI color codes to output a screenshot of the current screen to a text terminal such as xterm. You can record the PICO-8 rendering and replay it using “cat”! You can run PICO-8 over ssh! You can be anything you want. 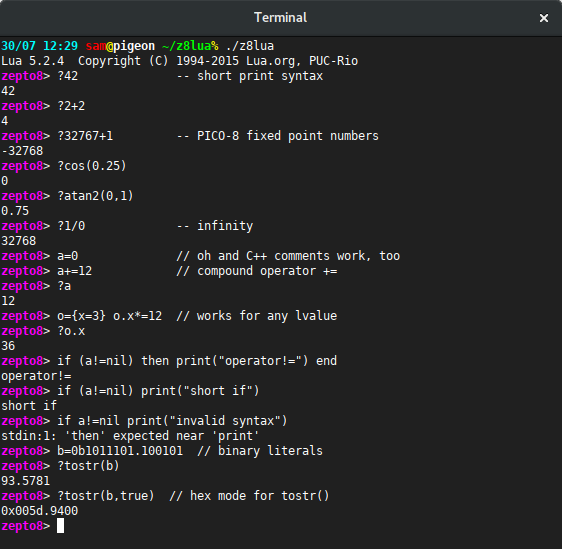 The terminal must be UTF-8 and 256-color aware, so this will probably work in most Linux and OS X terminals. On Windows I could test it successfully with the MSYS2 terminal. Will not work well on slow machines or in the web player. I’m toying with both hi-color images (using 60Hz flickering) and data compression, this is my first attempt. 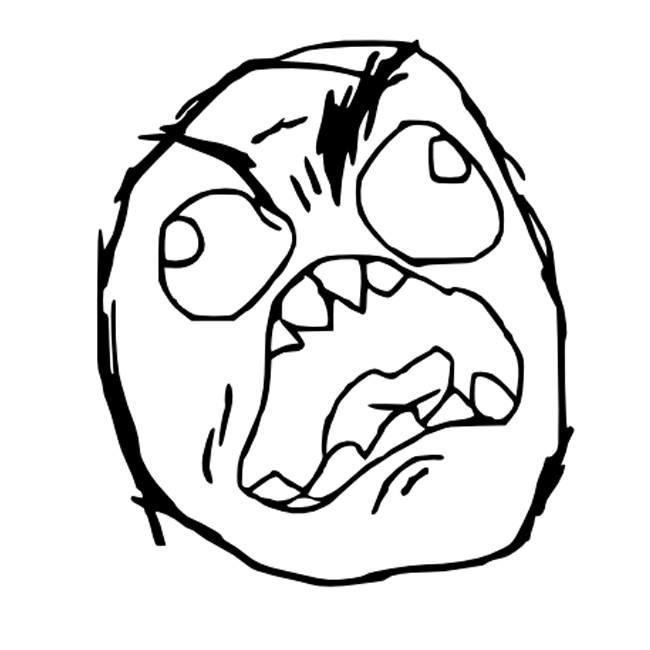 The image size is 128×188. The picture is of course a tribute to the Deluxe Paint series!